It's been a good year since I've gotten back into comics and I'm still kinda stuck on stupid that DC comics have been holding me down and not my childhood favorite Marvel. So when I heard about Marvel rebooting some of their titles (even though they try their absolute best to not call it a reboot) I was hoping and praying they would step their pen game up so I could rock with them again. But before I dive into some of the new Marvel Now titles, I'm gonna try out this new Daredevil series "End of Days" first, which is kinda strange cause I've never been a big fan of Daredevil but I figured what the hell, it can't get much worst then Avengers vs. X Men series....right? Well, I can tell you from the door that Marvel came correct with this one cause the whole concept of "End of Days" is dope! 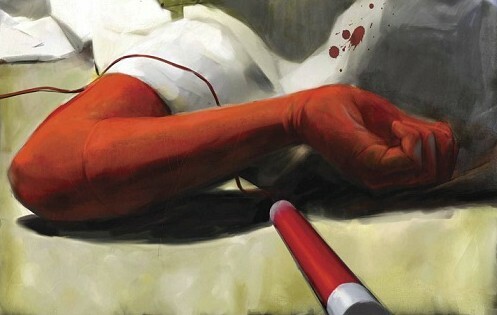 As soon as you open the issue, you find that Bullseye, Daredevil's long time nemesis has killed him. Yup, Daredevil is dead. So J. Jonah Jameson over at the Daily Bugle wants Ben Urich, one of his reporters to get out to the scene but Ben refuses. He's covered everything super hero related whether it was good or bad in the city and he knows nobody's gonna talk but he hits the streets anyway. While he's out doing some diggin' on the story, Ben comes across a camera phone video of the beating and right before Daredevil dies, he says "Mapone." So while Ben's writing his story, he realizes there's mad holes in Daredevil's story. From him disappearing after he killed the Kingpin (yeah, the Kingpin's dead too...I guess Marvel figured lets kill everybody off to get some more readers) to who or what is "Mapone. "So, in a nutshell the "End of Days" series deals with Ben trying to find out what REALLY happened to Hells Kitchen's most infamous hero and why.